The process of online job search offers a number of beneficial factors and conveniences. A job search these days is not possible without the internet and online hunt. Almost all large companies as well as smaller companies accept applications or resume online. To complete the process of online application submission, a job seeker is required to furnish his complete personal details. Scammers target on job seekers and try to steal people’s identities. For the same purpose, care should be taken to provide details for legitimate jobs and avert offering details unwittingly which can be beneficial for scammers. Let’s glimpse through a few tips to protect your privacy during a job hunt online. There are a number of fake sites who urge you to register in order to steal related data and so researching the site before submitting the resume is mandatory. When you have decided to forward a resume, forward it to the hiring manager directly. In case you’re submitting the resume on some job sites, research for the site and get to know about it if it’s a professional one. If you’re posting your resume on public job sites, make sure to limit personal information. You can avoid details such as home address, personal phone numbers as they aren’t mandatory. Run through the website and find out if there are any personal settings and make use of it. Use temporary phone number, email and P.O. Box at times of the job hunt. Temporary accounts are the basic tool which helps you protect your details and thus privacy is maintained during online job hunts. Always make sure and be leery about the ones who ask you for social security number and background checks. There are certain groups who request you for all these details prior offering a job. When doubt arises in your mind about the authenticity of the employer, then you can confirm the same with business bureau. An important factor which helps you protect your identity is by checking credit score each year. To protect yourself against identity theft and fraud, credit monitoring can be considered as a simple and efficient way. There are few companies who provide this as a free service for your safety. You can always confer your mobile service companies and also credit card companies and ask for in built protection. By this way, the verification process is tightened. When a third person tries to access your account, an identity confirmation is needed. In this manner your privacy is protected. Never forget to enable encryption and firewalls in your web browser. By this way unauthorized access can be avoided and thus your data is protected. Research and find out the latest firewalls with enhanced settings for security purposes. Latest safety measures can be purchased online too. When you have decided to upload a resume on a site, check out their instructions and find out if you can delete the resume later. If you have the rights to delete your resume, feel free to upload your resume, cover letter and other documents. On the other hand, when you’re unable to find rights to delete your document, email the site for a deletion policy. When there is no deletion policy, avoid sharing your resume on such sites. 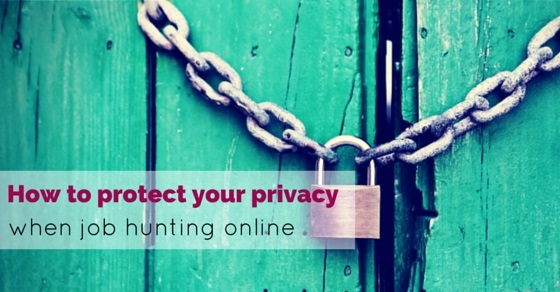 Privacy can be maintained by this way while hunting a job online. During the process of job hunting you can find that the application will require you to include a list of references. Try to avoid adding references in your cover letters and resumes. Instead, you can carry a copy of references with you to the interview, by this way, personal data isn’t shared online. Refrain from providing all personal details. Do not share bank account number, social security number, and personal data, driving license, eye color or marital status. All these aren’t necessary for any job application. Though you’re asked for all these details for a background check, do not provide the same as it is one of the oldest tricks to retrieve information. Always learn to be organized and keep a note of the sites where you have uploaded your CV. This would be useful when you need to reply to queries from job sites. You will know the job sites you have applied and will reply in the same instead of answering spam emails. There are a number of commission based recruiters who are waiting for a chance to utilize your CV and gain commission. So being organized can help you maintain your privacy during job search online. There are legions of job sites present online these days, instead of englutting your resume into all these sites make sure to research and find reputed sites. Rather than posting onto 10 or 15 shady sites picking a handful of trusted job sites would be beneficial and also guard your privacy details during a job search. Automatic responders are useful many a times, but when its job hunting responding person-to person is the right way. When an automatic responder is used, your emails are sent automatically from your email by which your identity is presented to the employer. An automatic distributor will also send your resume to thousands of emails and which you would never like. For the same, using automatic responders and distributors should be avoided and trusted sites for the same should be used. Research and get updated with scam warning signs and ways to distinguish them. This tip is important as it is tough to differentiate between scam and legitimate job sites. At times where people work from home can find it difficult to differentiate scam sites. Using scam warning signs can be of great advantage. The new trend that has evolved during a job search or interview is that employers are asking for social media login details during a face to face meeting. They try to run through one’s Facebook or twitter history, whereas the applicant sits helpless. Though social media login details are shared or not, it seems to be an unwelcome practice. Senators are planning to illegalize the activity and so would Facebook also. It is important to note that the mentioning date of birth on social media sites and job boards can be avoided. To steal your identity, name, contact details and most important date of birth is required by stealers. If you have mentioned, do delete it as it may not be safe enough. Your privacy can be maintained in this way during a job hunt online. Though there may be a number of unsafe routes online and a number of scammers are ready to grab your confidential data. Posting a cyber-safe resume can satisfy you and make your job hunt online secured. The tips mentioned above can be beneficial for job questers who hunt online and can maintain their privacy. Remember a background check isn’t conducted unless the employer meets the applicant and confirms him as an employee. And so providing private information is unnecessary, learn to post mandatory and required details which are ample for employers. By this way, your job hunt is made secure and privacy is also maintained.